Hey there, vintage purse lovers. Haven’t posted recently because I have been busy enjoying my first grandson, who was born October 22. Yes, your Old Bag is officially an Older Bag. 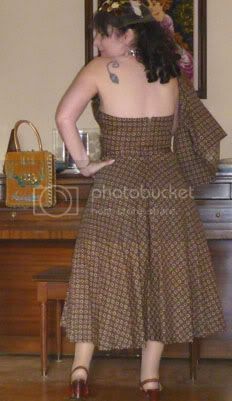 Here’s a picture of me in the outfit I wore to a recent vintage clothing and textile show in Burbank, California. It’s a 1950s cotton halter dress (two petticoats underneath) with matching cropped jacket, ‘40s alligator heels, and a '50s velvet and net fascinator. On the piano behind me is my vintage Midas of Miami turtle-motif handbag. Not too bad a look for a new grandma!